'Unfinished Business': When Working Families Can't Do It All How can women and men navigate the demands of a career and a family? Working couples must make sacrifices when balancing work and family — and there are often stigmas that come with both. 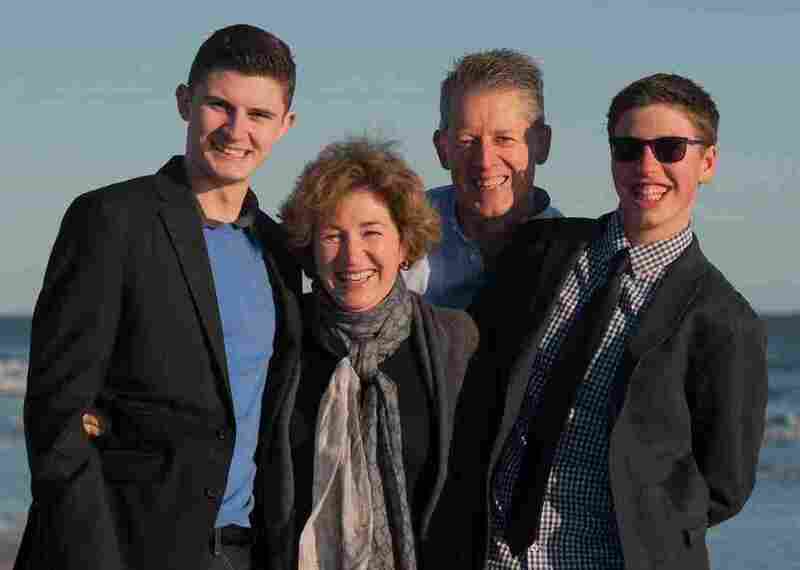 Foreign policy expert Anne-Marie Slaughter poses for a family photo with her husband Andy Moravcsik and their two sons. It's a phrase you hear everywhere now: work-life balance. How can women and men navigate the demands of a career and a family? In 2010, Facebook executive Sheryl Sandberg started telling working moms to "lean in." The conversation about work-life balance took on new heat when foreign policy expert Anne-Marie Slaughter wrote an article for The Atlantic about her own trade-offs. And women from all corners of industry have weighed in since. Slaughter's viral article chronicled her own choice to leave a high-powered job in Washington and go home to New Jersey and take care of her family. 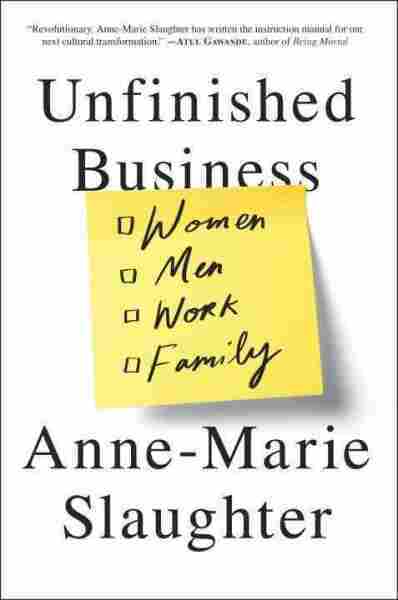 She digs deeper into the familiar struggle in her new book, Unfinished Business: Women Men Work Family. This week on For the Record: One marriage, two careers, two kids and trade-offs. Slaughter and her husband, Andy Moravcsik met in graduate school at Harvard in the late '80s, and started building a life together. They figured they would both pursue their careers, split the family responsibilities in half and it would all work out. Going in with blind optimism, they each worked their way up the ladder in academia. Moravcsik became a professor of political science at Princeton University and Slaughter was the first female dean of Princeton's School of International Affairs. And then, Slaughter got the call. "In December 2008, Hillary Clinton was about to become secretary of state, [she] asked me if I would be her director of policy planning, and this was a lifelong dream for me," Slaughter says. "And if I was going to do it, I had to do it then." Slaughter says that her husband "had always known that this was something I wanted to do ... he knew that when that chance came, if that chance came, I would want to take it." Moravcsik says he was excited for her, but doesn't deny the stress he felt. He would take care of the kids, while she would have to move to Washington, D.C., to live in an apartment there during the week and come home to her family on weekends. "It's really a great, great job. It was wonderful," Slaughter says. Meanwhile, Moravcsik says he was always thinking double. 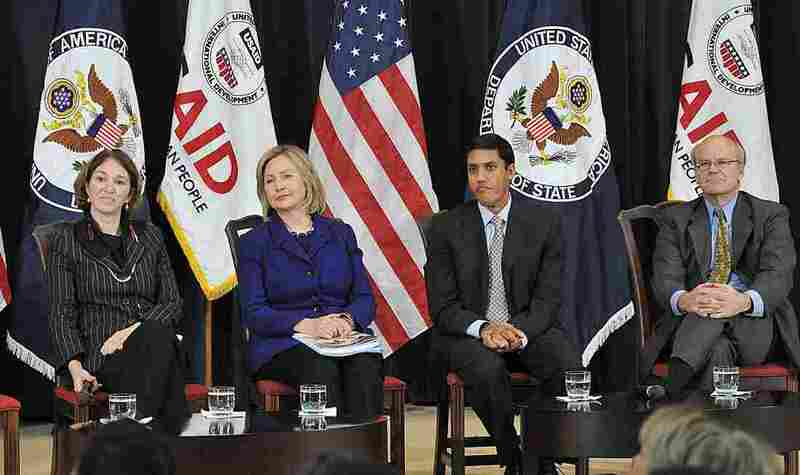 Anne-Marie Slaughter (left) former director of policy planning, sits with Secretary of State Hillary Clinton and fellow State Department employees, USAID Administrator Rajiv Shah and USAID Deputy Administrator Donald Steinberg, far right, in 2010. "I would get up in the morning, get the kids out. Usually a fight in the morning about it. And then do my work day until about 3 o'clock," he says. "What do I need to be doing at work? What do I need to be doing at home?" But it was also hard on Slaughter, especially the weekend transitions. "That first night's always a little rocky," she says. "I would occasionally feel a bit like an outsider. And then, just by the time we sort of felt like we we're a family again, I'd have to leave." While her husband developed a really close relationship with the boys, it was tough not being the lead parent for Slaughter. When their son was struggling in school, got suspended and began disconnecting from the family, it fell to Moravscik to bridge the gap. "I took him to a Shakespeare play and he said to me, 'How many plays did Shakespeare write?' I said, 'I don't know.' And he looked it up, it was 37. And he said to me, 'Why don't we go see them all?' And so, over the next year and half or so, we went and saw all 37 Shakespeare plays," Moravcsik says. That brought them closer together but it still wasn't enough. Moravcsik says he got to a breaking point. After a lot of discussion, Slaughter decided it was time to step back from her career and go home. "That was hard," she says. "I really did feel like I'm just not even sure who this woman is who's making this decision. I never would have predicted I was making this decision. But it is clear to me this is the right decision." Slaughter admits, however, that she was lucky to have as many choices as she did. For women at the bottom of the economic ladder, the stakes are higher. "The millions of women for whom not accommodating care, not making room for care, means that if you child is sick for a day or two you could lose your job," she says. "Or if there's a snow day and the school's closed but your job stays open, you could lose your job." Slaughter says the solution is going to come on several fronts. Government, she says, needs to push better family leave policies and businesses should recognize that flexibility makes for happier, more productive employees. Finally, she says, men need to speak up. "They are expected to be the breadwinners. They do not have the choice of saying, 'Look, I would like to be the anchor of my family,' " she says. "Men who do it face all sorts of discrimination and really, mockery." When Slaughter decided to pull back from her work and spend more time with her family she found herself being judged, sometimes by other women. "It was a kind of well, 'Maybe she's not as much of a player as I thought,' " Slaughter says. But that's when she realized, she's also been guilty of judging other women. "I'd been one of the women who had always stayed in who had big jobs, who was a role model, and I also knew I was making the right choice," she says. "I thought 'Wait a minute, this is not my problem, this is society's problem. And we've got to change it.' "
Slaughter is back at Princeton and she's the president of The New America Foundation, a D.C.-based think tank. Moravcsik is still teaching at Princeton; their oldest son is now at college and the younger is a 16-year-old high school student. Soon to be empty nesters, Moravcsik has some unfinished business of his own. "It's certainly time for me to double down on my career," he says. "I feel like those couple of books that I didn't write during the period when I was lead parent are still there to be written." @rachelnpr @SlaughterAM #nprtradeoffs always screwing everything up a little. We know this is something a lot of you are thinking about, so we put out a call on Twitter, asking for you to describe the kind of trade-offs you've had to make.